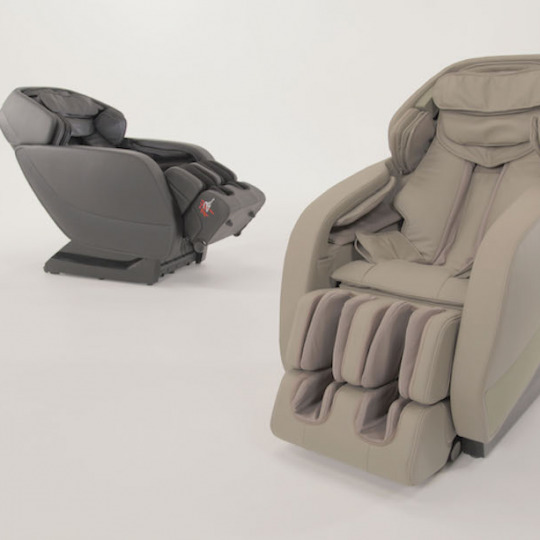 Zen Awakening’s ZenWave massage chair provides the ultimate full-body massage. The ZeroG and ZenPillow technology make for a relaxing and rejuvenating massage experience. The ZenPillow gently increases circulation and reduces tension in your neck and head. ZenAwakening has done it again with its latest creation, The ZenWave massage chair. Using its brand new 3D Advanced Soft MassageWave technology, the ZenWave delivers an amazing custom tailored back massage just like a real masseuse… every time! Featuring a LongRail track, the 3D Advanced Soft MassageWave hits every inch, from your shoulders down to the back of your knees! Shoulder soreness? Arthritis? Carpal tunnel? No worries! ZenWave has you covered. ShoulderCompress alleviates all of the aches and pains in your shoulder and rotator cuff. Beginning at your arms and continuing to your fingertips, ZenWave’s air pressure massage, ReCirculate, produces a gentle calming as it improves blood circulation, while soothing carpel tunnel and arthritis. Don’t forget ZenAwakening’s famous YogaFlex! YogaFlex decompresses your spine and joints as it stretches your back, taking pressure off your vertebrae and soothing overworked muscles. You can pair YogaFlex with the HipShape feature which provides a compression massage to your waist, thighs, and glutes... Not to mention CalfMassage compression for your calves and feet! Finally, FootReflex delivers an unmatched rolling massage to your body’s nerve endings. With YogaFlex, HipShape, CalfMassage, and FootReflex, you’ll have complete, full-body, muscle recovery after an intense workout or just a hard day at work! During all of this, Zero-G evenly disperses weight throughout your spine and elevates your feet, increasing circulation and reducing strain on your heart. And, our soothing HeatTherapy delivers indirect heat waves to your sore muscles and joints. Additionally, ZenWave’s LegExtender provides optimum comfort for every height, extending up to 10 inches tailoring a foot massage just for you. VideoMap, ZenWave’s high-resolution video remote control, allows you to easily select many therapeutic features… So simple and intuitive, and easily customizable. Finally, ZenWave’s SpaceSaver technology allows you to put your new best friend anywhere in your home! Only needing a few inches of clearance from any wall, ZenWave will slide forward before reclining, saving you room! As always, all of Zen Awakening’s models are backed with a limited lifetime guarantee. Run out to your nearest Zen Awakening dealer and take home your ZenWave today!